I had set up my dating site profile four months earlier and had experienced practically no interactions up until then, which was fine. With a couple of years of grieving over my broken marriage out of the way, I felt mostly content with my life—fulfilling job, healthy church, rich female friendships and challenging volunteer work. Still scarred and a little cynical about men (and God, to be honest), I felt no real urgency to have another man in my life and expected that dating would be about an even mix of thrill and disappointment. That’s where God really surprised me. Christian and I hit it off pretty quickly, even though I tried to maintain some skepticism at first. Within weeks, we both knew that something special was happening. We hold opposing political views, which I previously assumed would be a deal breaker. We discovered, though, that our differences in thinking about both public policy and theology just make the conversations more interesting. More importantly, our dispositions are amazingly similar, we enjoy many of the same activities (like exploring historical locations) and we always feel so at ease with other. From early on, I just kept telling people what an incredible gift from God this man was for me. I could not, and still cannot, believe how much we simply adore each other. I’m black and blue from pinching myself. I won’t go on and on. 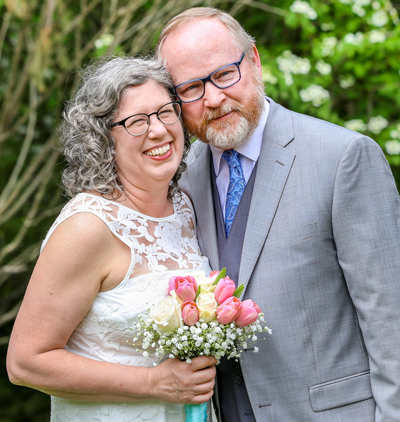 One thing led to another, as they say, and here we are married as of April 15 and as happy as clams! Our biggest challenge now is finding a new church home and watching for how God wants to use us in this tiny, historic, tourist town. We definitely want to be generous with the spacious home and lush gardens we are now caretakers of. *Thanks so much to Rachel Langerhans for her beautiful photography! Cheryl, thank you! So great to hear from you. I hope you are doing well! I”m so happy for you! Thank you Christi! I’m sorry I didn’t get to see you before I left town. I actually did think about it but ran out of time. Congratulations!! We will miss you in C-ville. May God bless you on this new adventure together! Lauren, thank you! I thought of you as I was packing up the house, but there was just too much to do. I hope you and the kids are doing well. I miss you! Lynn, so awesome to see you so happy! Gunselmans are thrilled for you! Thank you, my friends! I miss you! I’m thrilled and thankful that God has given you and Christian a wonderful new beginning! I’m just a little sorry it’s in WV (for me that is). Harper’s Ferry sounds beautiful. My prayers for you have been answered in true God form…beyond what I could ask for or imagine! Thank you, Darian! Maybe you and Allen could come up for a visit sometime. We have plenty of guest space! Hugs to you!